This unusual clock uses industrial styling with a traditional analogue type dial. Battery operated it has all the normal functions that you would expect from a modern clock . 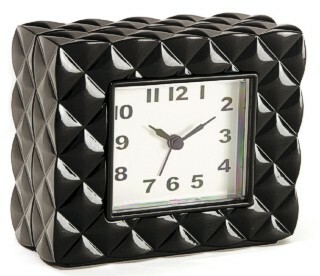 The clock is made in a multi faceted shiny black finish and is 12 by 7 by 15 cm wide (5 by 3 by 6 inches).